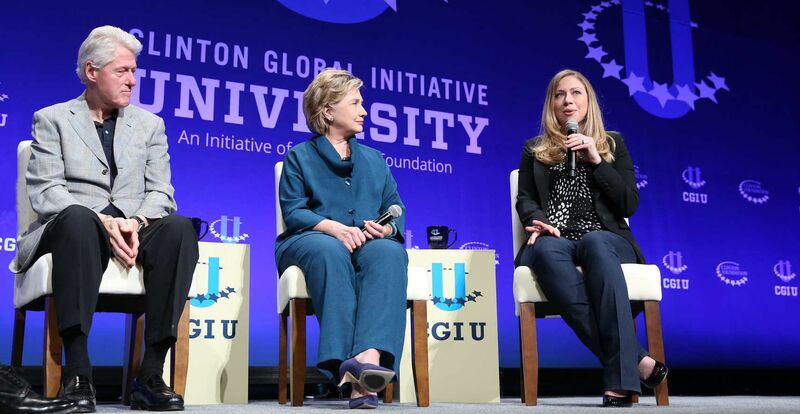 By Jon Greenberg on Thursday, July 7th, 2016 at 11:02 a.m.
For Republicans, the Clinton Foundation offers endless opportunities to cast Hillary Clinton as too cozy with the world’s elites. The multimillion-dollar charity has ties to governments and the ultra-wealthy around the globe. Case in point: In the wake of the Orlando shootings, when Clinton called on several Persian Gulf states to crack down on wealthy citizens who were funding Muslim extremists, presumptive Republican nominee Donald Trump posted this response on Facebook. About 300,000 people responded to that post, and it was shared more than 56,000 times. We wanted to know if Trump’s $25 million figure was correct. We soon found that independently confirming information about the Clinton foundation is challenging at best. Nonprofits, such as the Clinton Foundation, have nearly no obligation to publicly reveal who gives them money. They might need to tell a government agency, but the details remain confidential. We asked the Trump campaign for proof and they didn’t get back to us. The only thing we found from the campaign was a list that included broad-range figures of the Saudi donations to the foundation, along with donations from an unnamed group of "Friends of Saudi Arabia." Trump can’t prove that he’s right. But by the same token, it’s just about as difficult to prove conclusively that he’s wrong. The fact that we know anything about the Saudi donations stems largely from the unique politics surrounding the foundation and Clinton. John Wonderlich, head of the Sunlight Foundation, a group that advocates for greater transparency in government, told PolitiFact, "The Clinton Foundation’s work, by its nature, blurs the lines between charity, business, politics, and public service, making it very difficult to evaluate in a traditional way." From the very moment Hillary Clinton was put forward to be Barack Obama’s secretary of state in 2008, the potential for conflicts of interest tied to the Clinton Foundation was front and center. The international health and development project was the brainchild of Bill Clinton, and foreign governments were giving millions. Until 2013, Hillary Clinton had no formal role, but the possibility that donations to the foundation might influence foreign policy decisions would never pass the smell test so long as Clinton was running the State Department. To allay those concerns, the foundation signed a memorandum of understanding with Obama’s presidential transition team in December 2008. Under the terms of that agreement, the foundation promised to report its donors in order to avoid the appearance of conflict of interest. It would say who gave, but it wouldn’t say precisely how much. Instead, donors were revealed in broad dollar ranges. The agreement was signed for the foundation by Bruce Lindsey, a longtime Clinton adviser and the foundation’s CEO, and by Obama adviser Valerie Jarrett for the presidential transition team. Saudi Arabia gave again in 2014, but it was a small fraction of what the Gulf State kingdom had given before. These details come from news reports, and when we brought the numbers to the foundation staff, they said they were accurate. However, thanks to the laws protecting donor identities, we can’t confirm these amounts independently. Everyone has to work with the level of disclosure that the foundation agreed to in that memorandum of understanding, and the memorandum doesn’t include any mechanism to check or enforce disclosure other than the foundation’s own willing compliance. The foundation first revealed Saudi giving in December 2008. The total was in the $10 million to $25 million range then, and it hasn’t changed since. We don’t know what "friends of Saudi Arabia" the Trump campaign had in mind, but we did see that Saudi billionaire Sheikh Mohammed H. Al-Amoudi has given between $5 million and $10 million over the years. Those who look at the foundation and smell a rat have argued that it should spell out individual donations from any government, foreign or domestic. The support for that position is iffy, but there is at least some basis for thinking that some disclosure might be required. Until 2015, the Internal Revenue Service asked nonprofits to report government grants, but it didn’t specify that they should be individually listed. Nonprofits filing in New York State also have a line on the state form to report government grants. The Clinton Foundation is registered in New York. In a recent article, the right-leaning website ZeroHedge.com said that based on those state filings, in 2010, foreign governments gave the foundation $7.8 million. Between 2011, 2012 and 2013, the New York filings showed nearly $10 million in foreign government donations. Lumping all foreign grants together raises the hackles of the foundation’s critics, but Matt Mittenthal, press secretary for the New York Attorney General’s Office, told us that other foundations with international donors do it, too. In fact, some organizations itemize and others don’t, as we found when we searched the New York charities website. For example, the Carter Center (the project of President Jimmy Carter) lumps foreign donations together, while the Save the Children Federation, in 2011 at least, itemized its donors. Mittenthal told us the state asks for that information not out of concern with foreign influence, but to head off state-level graft. The main worry is with public officials steering state dollars to a favored charity. Mittenthal told us the Attorney General’s Office is working on clarifying how much detail nonprofits need to disclose. As things stand, the Clinton Foundation is in step with federal and New York reporting standards. Unless government agencies change the rules or their interpretation of the rules, we are still wholly reliant on what the foundation has chosen to reveal. Working backward from the numbers we have in hand, it seems fairly certain that Saudi Arabia gave about $10 million in the early 2000s, well before Clinton became secretary. That number would grow in 2014, but it didn’t double. That would be a 100 percent increase, and the foundation said the 2014 amount was a small fraction of the total. So we are left with the Saudis giving less than $25 million. Now we can ask, did Clinton get that money for the foundation, as Trump said? Josh Schwerin, spokesman for the Clinton campaign told us, "Hillary Clinton did not solicit these funds." As a legal matter, Clinton was not a member of the foundation’s board until 2013, after she left the administration. She was a board member in 2014 when the Saudis gave again, but that amount would be much less than $10 million. There were no Saudi donations while she was secretary. But if she ever attended an event with her husband -- official or unofficial -- and Saudi representatives were in the room, questions could arise. An example of how money, charity and foreign agendas can overlap emerged after Clinton joined the foundation. In 2014, a Canadian agency gave about $500,000 to a job training program in Cartagena, Colombia. The foundation announced that the money would give new opportunities to 20,000 teens from some of Cartagena’s poorest neighborhoods. The potential benefits were clear, but less obvious were the interests of the Canadian agency, the Department of Foreign Affairs, Trade and Development. That department backed the Keystone XL pipeline, a project that would have sent oil from Alberta’s tar sands down to Gulf Coast refineries. While President Barack Obama ultimately rejected the pipeline, at the time, U.S. approval hung in the balance. As Kirk Hanson, director of the Markkula Center for Applied Ethics at Santa Clara University in California, told the Wall Street Journal, the "potential exists for foreign governments to curry favor with (Clinton) as a potential president of the United States." Getting back to Saudi Arabia, working with them would necessarily be a part of any president’s job. Its donations might not make a difference, but there is no question that the foundation’s work creates a tangle of relationships. That does not, however, prove Trump’s point.